Online jobs are getting more and more popular because, people are becoming overwhelmed by the internet. For that, the unemployed people who need fast money are straightly going to the online jobs as it easy to get and has some fascinating stories. 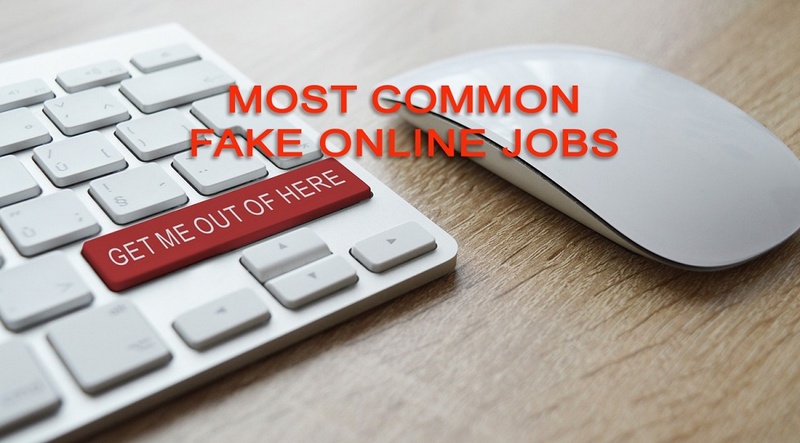 But, as you know that the Internet is not always a safe place to communicate and work so, here presenting a few most fake online jobs which are very common. The “Fake online jobs”- doesn’t only mean the jobs which never pay to their client, the jobs which are not keeping their promises are also counted as fake! Actually, a majority online job seekers are mostly cheated by the second type of job providers. Because, clever cheater does not cheat at the very first stage. If you take a look on online complaint sites, then you can find thousand of people complaining against those types of online job provider companies who never keep their promises. Well, I’ve already warned people about fake Ad posting jobs through my posts. And, once again, I like to inform you that, online Ad posting jobs can not be 100% genuine as it has no proper source where a job provider can convert clients’ ads into money. So, the only process left is rotating of registration fees which is surely fake process. This online job is the second most popular fake online job according to my list. Generally, we know that data entry means converting printed, written documents into digital format. It was very much popular earlier, but, now I think nearly all the necessary documents and books has already converted. Still, only a few governments/public firms are tendering data entry which is very small that a company can run depending on that. Proof reading and Data entry jobs are like brother and sister. They are directly related to the each others. The digital written words come from the data entry need to be checked, so the, proof reading come into play. But, all is surely fake cause, if we found online data entry has no strong base, then how proof reading can be genuine! That’s the point! This job is a part of Cyber crime! Common people have no knowledge what they are doing by doing this job. Let’s clarify the subject- Captcha is a security checkup for the high secure website like Google, Yahoo, Ecommerce platform like Amazon, etc. For instance- if someone tries to create too many Gmail accounts using a software which generate names, username, passwords automatically then it definitely goes through a security checkup called a Captcha solving. Spammer can’t bypass this security using any software cause, it’s written in image format. So, they hire innocent common people to bypass the security checkup. So, CAPTCHA solving job is purely illegal. I don’t believe in survey job anymore. Earlier, small and medium size business did not have the infrastructure to get customer opinion of their own to make their business/service more customer friendly! So, they hired a third party to do the job who had the infrastructure. But, now almost every company/organisation (who need customer opinion) has their own infrastructure. Beside this, today, many beautiful and fully functional survey software available in the market, which is more affordable than hiring a survey company. Does people really don’t have much time to read emails? Do companies really pay for reading their promotional emails? If so, then what is their business plan? How they are converting reading emails into money? All are fake! There is no such legitimate way to make money by reading third party emails. It’s also a trap. Yes, it’s true that many small and big companies still doing SMS marketing to get customers or to promote special offers but, no one is using a third party. Today, many advanced marketing tools and companies available by which you can promote your business message with a little capital. So, SMS sending job is now only for cheating common job seekers. Keep your eyes open. Don’t be fool online!